Discover a unique, dynamic opportunity that will delight guests at your next function. The Museum is available after hours for receptions, award dinners, corporate meetings, client appreciation, bar and bat mitzvah, birthdays, holiday parties and more for up to 300 people. The Museum’s exhibit areas are open for guests to explore. Reserve Your Party Space Today! The Museum is open to the general public from 10:00am to 5:00pm. Non-exhibit areas are available for private rental during operating hours. Exhibit areas are available for private rental only during non-business hours. The Museum is not available for fundraising events. Basic during Museum Hours - Subject to room availability (up to 75 guests). Light refreshments permitted. Basic after Museum Hours - Up to 3 hours* (up to 150 guests). No food permitted. Basic Plus Reception - Up to 4 hours* (up to 150 guests). Light refreshments, no tables, no alcohol. Stand-Up Reception -Up to 4 hours* (up to 300 guests). Food, white wine, beer permitted; proof of insurance required, no tables. 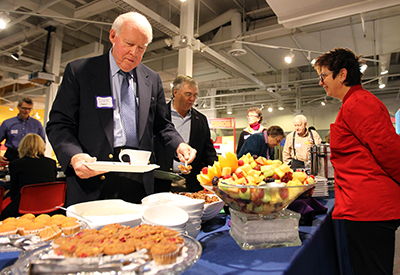 The Museum can suggest several local caterers that are preferred vendors. Caterer is responsible for all party set-up and take down. Clean-up is the renter’s responsibility. A $100 damage deposit is required. Your guests can park on the street (meters are free after 6:00pm) or in the Ann/Ashley parking garage which charges a flat fee after 6:00pm. Click here for more info. Museum Rentals brochure (99K PDF) is now available for download.